My sister asked me for my gingerbread cookie recipe, so I decided to share with all of you. *In a large saucepan, combine the butter, sugar, corn syrup and spices; bring to a boil, stirring constantly. Remove from the heat and cool to lukewarm. Stir in eggs and vinegar. Combine the flour and baking soda; stir into sugar mixture to form a soft dough. Chill for several hours. On a lightly floured surface, roll dough to 1/4 in. thickness. Cut with a floured 2-1/2in. gingerbread man cookie cutter and place on greased baking sheets. Use red hots for eyes and buttons. Bake at 350 degrees for 8-10 min. Remove to wire racks to cool. Yield: about 6 dozen. * I also like to use the tiny 1-1/2 in. gingerbread man cookie cutter. Every year My kids and I like to make gingerbread houses out of graham crackers and frosting. These little guys are the perfect size to use with these edible homes! 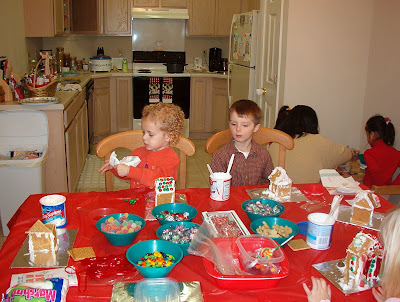 A couple of years ago we had a little gingerbread house-making party. Hard to see, but in one of those green bowls are a bunch of those tiny, homemade, gingerbread men. They are so cute!! I hope they turn out for you, Brooke!